Surely, we’ve all done it? Valentine gifts often start appearing in our shops while we’re still recovering from the excess of our New Year’s celebrations. The roses, chocolates, pink champagne and cute teddy bears fill the shelves of the ‘seasonal’ aisle so far in advance of the ‘big day of love’ that we walk past them for weeks. They serve as a vague prompt to St Valentine, but cease to be a timely reminder of the need to purchase a pink, or red, love token for our nearest and dearest in the crucial few days before the 14th February. I’ve walked passed the garish pink display many times with the promise of ‘I’ll get something next week’, only to experience that ‘oops’ moment on the eve of Valentine’s Day. If that happens to be you this year, then here is the perfect solution – a homemade gift, using a few store cupboard items. Of course, if you don’t have white chocolate, biscuits, cheese, or more importantly, cherries, in your cupboard, then nip and get them and feel virtuous that you didn’t just buy that withering bunch of roses. 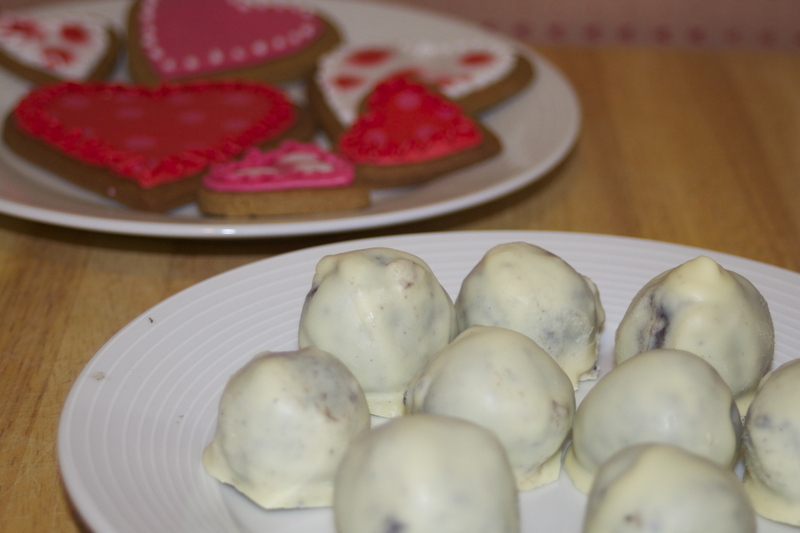 Valentine’s Cherry Truffles! Blitz the Oreo biscuits in a food processor. If you don’t have a food processor, you can put them in a plastic bag and bash them with a rolling pin, but they do need to be smashed to a fine crumb. 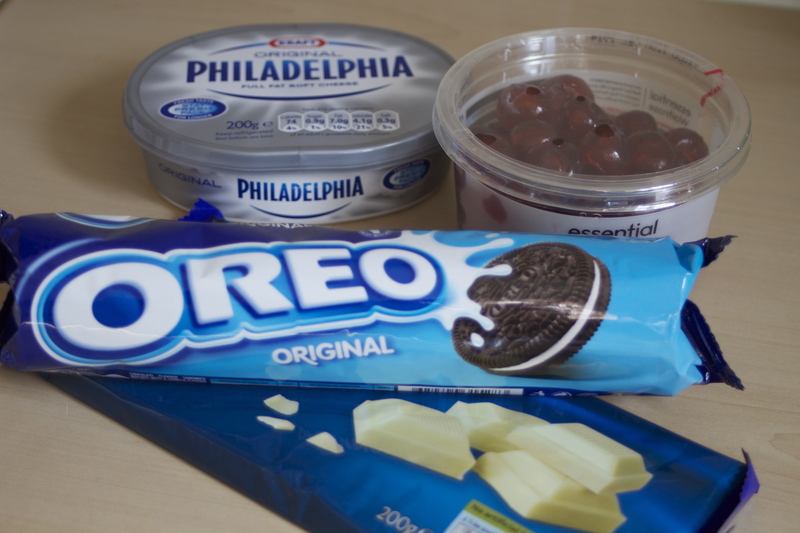 Tip about a quarter of the cream cheese into a bowl and add the Oreo ‘dust’. 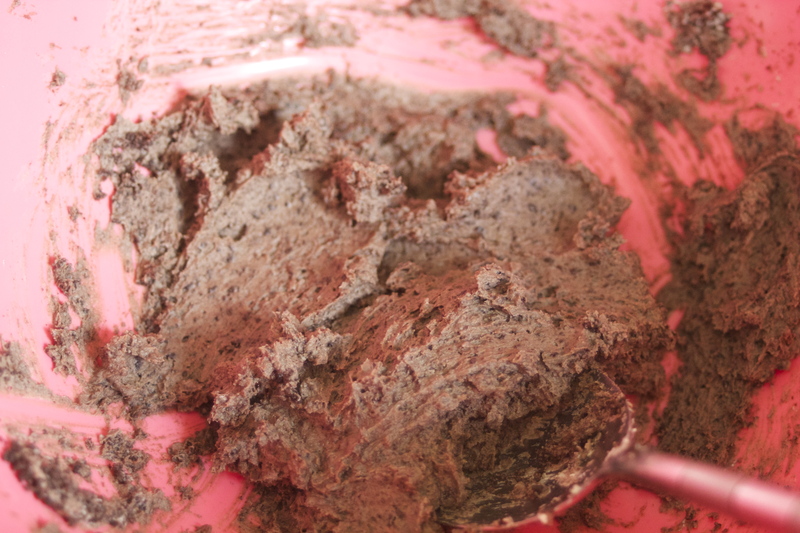 Mix them together with a fork until well blended – together they make a brownish paste. Place a sheet of baking parchment on a baking tray, or plate. Take a glace cherry and a small amount of the paste and mould it around the cherry. Roll into perfect balls using the palms of your hands, and place on the baking parchment. 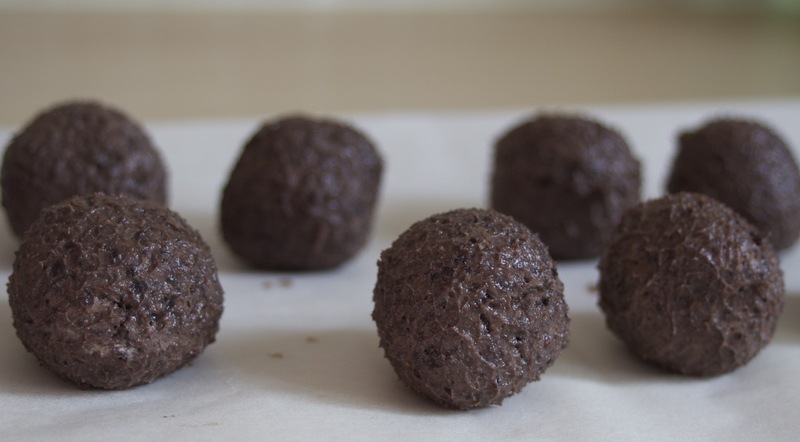 Do this until you’ve used up all of the paste mixture – we made 10 truffle balls with our mix. Place the tray, or plate, of truffles into the fridge for at least two hours, though overnight is best, if you have time. 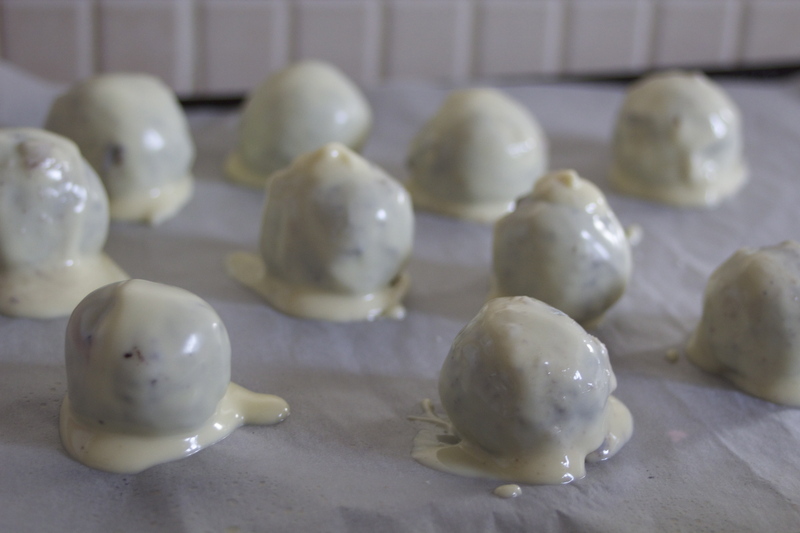 Chilling your truffles is vital to stop them melting into the chocolate coating – believe me, I know! Melt your chocolate in a microwave, or in a glass bowl over a pan of simmering water – make sure the bowl does not touch the water or your chocolate with overheat and go grainy. 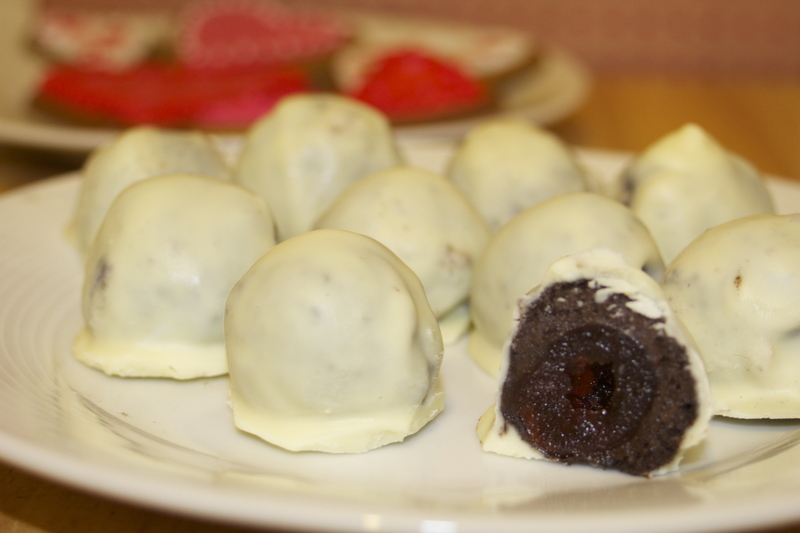 When the chocolate has melted, take the truffle balls (one at a time) and roll them quickly in the chocolate to get a good coating. Transfer them back to the baking parchment and leave them to set.